The All in One Instant, Waterproof & Antifungal Adhesive waterproof sealant from C-Tec offers an incredibly strong seal on virtually any material including Metals, Glass, Mirrors, Wood, Polystyrene and many more. Favored by professionals from the construction, engineering, and marine sectors, the CT1 is making the use of many competitors' products redundant. 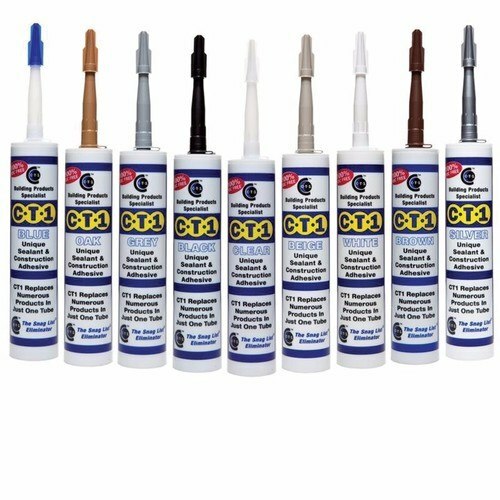 This all-in-one adhesive sealant is brought to you now in a range of colors, to create a perfect match to any surface you use it on. This product is ideally used with an Avit Sealant Applicator Drench Gun. I had asked a plumber to fix my bath which was leaking around the taps 3 times before i decided i would do it myself with some better quality product. So far so good and much cheaper than getting the plumber back! Great stuff, I won't bother using cork or silicon again, plus an amazing adhesive too! It’s just the stuff to use, if you want to get the job done right first time! It certainly does what it says. Excellent service and excellent product. I have read the reviews and would like to buy this but im in the USa will this get to me ok? Electrical World Replies: Thanks for your question , we sell quite a bit of this to the USA , Austrailia and other countries throughout the world , at checkout you will see your shipping options and these are generated according to the country your requiring shipping to. Is this product suitable for sealing my skimmer unit / filter unit to my hot tub? Also how long does it take to cure hard? Thank you. Electrical World Replies: Hello, thanks for question. We know other customers who have sucessfully used this to seal in filter units into goldfish tanks, hot tubs etc. It depends on a number of factors such as what way the filter is designed and how much of a gap you are trying to seal and what type of material you are trying to seal to. I would suggest contacting the manufacturer and asking them what product they recomend - i.e if its a Multi-Purpose Adhesive Bond Sealant CT1 is one of the best products in the market so you can then confidently use it. Electrical World Replies: Hello , this product has anti-mold and anti-fungal properties. This product has incredible strength properties once cured and can be used in wet conditions but you will achieve maximum results when used dry and if it has time to cure. How do you clean up any areas of unintended application? And, how long do I have to shape the product before it starts to cure?